Just a quick note to say a very big thank you for entertaining us at the Worcestershire Golf Club. We had some great feedback from our members who enjoyed Sam and Laura’s excellent performance. Sam was there very early and made sure that the whole setup was first class, making some great suggestions for improving the look and the ambience of the venue. His professionalism is a joy to behold! We thought they gauged the mood of the audience to a tee and that the set was just perfect for the night. The quality of the sound was excellent, and the visual effects added to the New Year’s Eve feel. Once again many thank for all your efforts, we hope you enjoyed it as much as we did and we hope to see The Lady and The Sax back at the Worcestershire Gold Club in the near future. Jim Wild – Club Captain, Worcestershire Gold Club Ltd.
On behalf of Knowle Royal British Legion, I would like to thank The Lady & The Sax, with David Lawrence, for a fabulous performance last night. The range of music was outstanding, including great interaction with the large audience. It is not often that nobody leaves before midnight! We are keen to book you again in 2013 and would be delighted to recommend your act to prospective interested parties. Booked the most professional and talented cabaret acts for my Lady Captain’s Evening at Hagley Golf and Country Club. The Lady and The Sax surpassed our expectations… we have seen Sam several times and he never ceases to amaze us. He is one of the most enthusiastic and versatile acts. David Lawrence was the icing on the cake. His rendition of Nessun Dorma had the ladies in raptures, resulting in a standing ovation! All who attended the evening request a repeat performance for next year! What more can I say? Thank you for making my night such a fantastic success. Hope to see you again soon. Just a note to thank you both for your fabulous performance at our staff social. You provided a terrific musical backdrop to our event with a good variety of music played. You interacted with adults and children in a professional and friendly way and really brought the audience to life. Hope to see you again soon! Once again the entertainment was of the highest standard and that is the view from everyone who attended. Any organisation engaging Sam and his wonderful lady can do so confident they will get top class entertainment at value for money cost. What is unique about them is they really enjoy what they are doing and there is never a question of clock watching to finish, they just go on and on until virtually the last person is standing! Again a big thank you for such a great contribution to our Captain's spring ball and we hope to engage with you again in the not too distant future. Just to say a big big THANK YOU to all of you for Friday, you were amazing I was so pleased - the TV Crew said it was the best organised, best food and BEST entertainment they had seen in all the recordings of the shows they had worked on! Let’s hope the Brides think so, but more importantly Blair and Dean loved you. Once again thank you to you all, can’t wait to work with you again. On behalf of Wyre Forest GOLD, many, many thanks for another wonderful performance at our Christmas concert for adults with learning disabilities and their families and carers. They all look forward so much to seeing you at this event, which is, for many people, the start of the Christmas festivities. You gave an amazing performance, as usual - full of energy and with some great songs, just right for the occasion. Your performance with the other artistes, Debbie and Julian and with our compere John, were fantastic and the whole concert was brilliant – full of superb music, humour and audience participation. The audience really feel part of the concert, thanks to your encouragement to them to join in with the songs and get up and dance! Many thanks again to you and to Jill for supporting the work Wyre Forest GOLD do in this wonderful way. Thank you SO much for providing our wedding entertainment, we thoroughly enjoyed ourselves and we had so many of our guests rave about you. Sam, Lisa Marie and David - you are simply awesome! We will be recommending you whenever we can! I would just like to thank you all again for a fantastic evening on Saturday. Mum had the most amazing surprise when she arrived, all topped off with Sam and Debbie entertaining us all evening in their own special way. They catered for all ages and styles with a wide range of music and I particularly loved it when they involved members of the party in singing, dancing and even La Bamba in Spanish! Mum is still on cloud 9 and constantly talking about the party and will be for a long time to come I am sure. Thank you once again for a wonderful evening, I will recommend you to everyone, and I hope to see you at future events where you will wow the crowds once more. Thank you so much for performing at our wedding you really were fantastic, the saxophone playing and also your singing voice were both amazing! All of our guests were very impressed and we have had some lovely comments back about you. Thank you so much for helping to make our special day so memorable. Ros and I had a fabulous evening and every one of the guests I spoke to said how much they had enjoyed the entertainment. The Lady and the Sax together with the guest vocalist really made the evening. The music was excellent and was very professional and polished. I have already recommended your act to a number of friends and I would be delighted to make any future bookings if and when I get the opportunity. You may be interested to know that one couple who were guests said it was the best entertainment they had ever experienced at a Ladies Night - they should know as they have been to countless such evenings over the past 30 years! To make a successful Ladies Masonic Evening is never easy. The Lady and The Sax with guest artiste David Lawrence were quite superb. Music was designed to suit everyone and the performances were of an exceptional standard. I can think of no event their talent, expertise and charm could ever be anything but entertaining and magical. A truly wonderful evening, thanks to them. 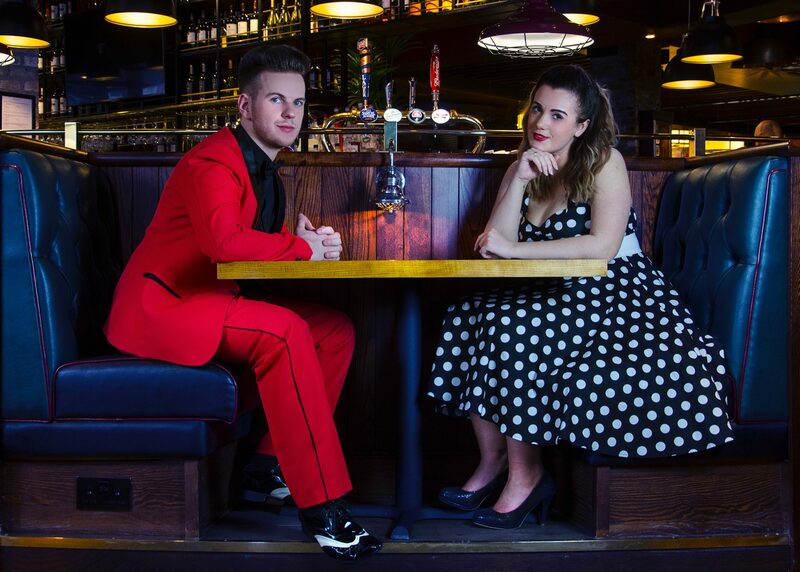 The Lady and The Sax enjoy a broad repertoire, bringing youth and vitality to classic Rock and Roll, Swing, Blues and Jazz/Pop music from the 1950’s to present day. The duo perform stand-out vocals, along with tenor / alto saxophone and harmonica accompaniment, all with professional backing tracks, so you get the sound and quality of a full band. The song list is regularly updated and we are also happy to consider performing any special song requests you might have for your particular event - so if something you love isn’t listed, just ask!